Bloodhound, the Odin-worshipping raven-touting tracker of Apex Legends characters, is a real asset to any team if played correctly. Their abilities offer a completely different style of play to the other Legends, revolving around positional awareness and hunting down enemies. Our Apex Legends Bloodhound guide will walk you through this colourful (or colourless…) array of abilities, alongside numerous practical and little-known tips and tricks to employ to get the best out of each one. For full details and opinions on all of the characters together, take a look at our Apex Legends characters guide for everything you need. Alternatively, if you’re looking for a focused guide like this one but on a different Legend, then simply take a look at the table below and click on a link to be taken to the hero of your choice. Each of these pages is fully up to date with the latest tips for the start of Season 1. There’s quite a bit to talk about in this Apex Legends Bloodhound guide, thanks to the layers of complexity behind each of their abilities. Click on any of the links below to skip straight to a particular section if you’re struggling to understand how to get the most out of this unique and powerful Legend. Bloodhound, like any good Legend, has a skillset that befits both aggressive and defensive plays. Their heightened senses gives them more information about enemy whereabouts than any other character, which makes them an excellent choice not only for experienced players looking to rack up kills but also for newer players looking to avoid difficult confrontations. Their Tactical and Ultimate abilities both highlight nearby enemies, and can also allow them to see through vision-obscuring phenomena such as Bangalore‘s Smoke or Caustic‘s Nox Gas. 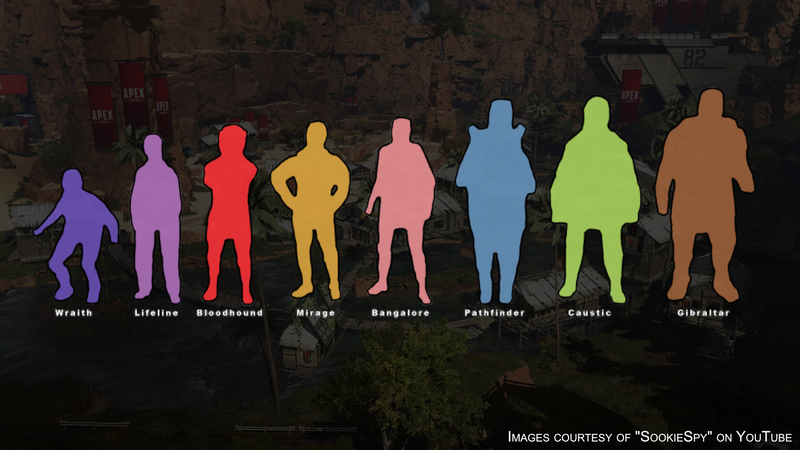 This means they can slot very nicely into a team comprised of one or more of these individuals, as Bloodhound’s vision will be unfazed by a couple of Bangalore’s Tactical abilities enveloping the enemy team in smoke. Bloodhound’s main weaknesses are that their only hope for escaping a difficult situation is to use their Ultimate, which grants them extra movement speed; and that their Tactical ability, while situationally useful, is a double-edged sword which allows the enemy to discover your whereabouts as easily as you discover theirs. Click the above image to view it at highest resolution. The above is a composite of various hitbox images created by YouTuber “SookieSpy”, which bring to light the incredible discrepancies in character hitboxes in Apex Legends. Season 1 brought with it some changes to the hitboxes of Gibraltar, Caustic, and Pathfinder to better fit their character models, but the fact remains that Gibraltar is about twice the size of Wraith, and thus, twice as easy to hit. This was addressed with the 1.1.1 Patch Notes (which you can read about in more detail in our Apex Legends update guide), which gave Gibraltar and Caustic the new “Fortified” Passive, which reduces all incoming damage by 10%. Bloodhound sits in a respectable third place position for the smallest hitbox, beaten only by Wraith and Lifeline. And they are only very slightly larger than Lifeline herself, so players will have a much harder time hitting you than, say, big bulky Gibraltar – especially if you’re making good use of Bloodhound’s Ultimate. Bloodhound’s abilities give them a very different focus and skillset than any of the other Legends in Apex Legends, revolving around locating enemies and hunting them down without their knowledge. Let’s take a look at each ability in turn and some things to bear in mind when utilising each of them. Tracker See tracks left behind by your foes. Bloodhound’s Passive is one of the most nuanced abilities in Apex Legends. It’s a Passive, so of course you don’t need to do anything in order for it to work; but, just like Wraith’s Passive, you have the choice to ping any of your findings – and I strongly encourage that you do so, because your teammates will not be able to see what you can see as Bloodhound. Tracker gives Bloodhound the ability to see the activities of enemy players if you are standing near where they were less than 60 seconds ago. You will see a notification pop up telling you what can of action was performed here and how long ago in seconds that it took place. These actions can be anything from a footprint to bleeding out, from picking up loot to deploying a Lifeline bot. You can use this information not only to follow your enemies and ambush them from behind, but also to gain useful information as to their character choices and their current status. The full list of clues that Bloodhound’s Passive can warn you about are: Use Door, Destroy Door, Class Deployable, Death, Killer, Heal, Reload, Bleedout, Took Damage, Fire Bullet, Throw Grenade, Opened Supply Drop, Opened Loot Bin, Zipline Start, Zipline Stop, Footprint, Slide, Mantle, Jump, Wraith Tactical Start, Wraith Tactical End, Smoke, Gas, Pickup Loot, Drop Loot, Caustic Trap, Lifeline Bot, Gibraltar Shield, Wraith Ultimate. Communicate your findings with your team! They cannot see the clues enemies leave behind, so it’s your job to keep them in the know. Pinging a clue does not let your teammates know how long ago the enemy in question was there, so it’s best to tell them yourself over voice or text chat. Eye of the Allfather 35s Briefly reveal hidden enemies, traps, and clues throughout structures in front of you. Bloodhound’s Tactical, Eye of the Allfather, is a useful ability that can backfire quite easily if you don’t use it under the correct circumstances. Using it will create a conical radar pulse that radiates out in front of you, passing through walls, terrain and any other obstacles, and vividly highlighting any nearby enemies, traps or clues nearby. The thing you must absolutely bear in mind whenever you use this ability is that everyone, including enemies, can see and hear this pulse radiating out from where you are standing. So if enemies are nearby, then you’ve likely just told them exactly where you’re standing in the same instant that your ability has told you where they’re standing. So this is not an ability to be used if you are attempting to hide and heal, for example. It’s also worth noting that the ability will only highlight enemy whereabouts at the exact moment the radar pulse touched them; this highlight will persist for several seconds, but it will not track enemy movements during this time, so if an enemy has moved in that time (which is likely, considering they can see and hear you using this ability) then you won’t necessarily know about it. Eye of the Allfather does not radiate out in all directions as many mistakenly believe; it is in fact directional, operating in a cone area where you are looking. So make sure you’re facing the correct direction when you use Bloodhound’s Tactical. If in combat, you should only use this ability if you have the upper hand or are in a stalemate situation; never use it if you’re on the defensive, because it gives away your location. Bloodhound’s Tactical will allow you to see enemies through Smoke, Gas, and structures. This ability is fantastic when combined with Bangalore’s Smoke Canisters or Caustic’s Nox Gas, because you can disorientate the enemy while still being able to see them through the haze. Eye of the Allfather will highlight every clue in its range, allowing you to clearly see footprints and the directions of the enemy if you are having trouble finding them using your Passive alone. Beast of the Hunt 35s 3m Enhances your senses, allowing you move faster and highlighting your prey. Bloodhound’s Ultimate is meant for initiating fights, though it can also be used to quickly disengage and run to safety. Providing a 25% movement speed increase for 35 seconds and allowing you to see footprints and enemies perfectly even through Smoke and Gas, Beast of the Hunt is where Bloodhound finally gets to have a little fun of their own. Unless you are against another Bloodhound, no retreating enemy will be able to outrun you while you are transformed. It’s a fairly straightforward ability, really, and you’ll generally want to use it to close the gap between you and the enemy, which is where Bloodhound really excels. The movement speed allows you to move faster with a gun than your enemy even if they are sprinting while holstered; and it allows you to “dance” (or “A/D spam”, or whatever you want to call it) much quicker and more effectively than other Legends, making Bloodhound much more difficult to hit and take down, particularly at close range. Using Beast of the Hunt turns your screen and surroundings greyscale, and highlights enemies and clues in red, allowing you to see them very clearly. It’s always best to use your Ultimate as you’re heading into a fight; don’t keep hold of it just so you can use it if things go south for you and your team. But if your Ultimate happens to fully charge during a fight and you want to use it to reposition, then go for it. Movement speed in Apex Legends is identical whether you’re moving forwards, backwards, or strafing to the left or right. This means with your Ultimate activated, Bloodhound can strafe very quickly to avoid shots. You can very clearly see all enemies, footprints and clues while transformed; and they are highlighted at a longer range than your Tactical ability too. Unlike their Tactical, Bloodhound’s Ultimate actively tracks enemy positions with the highlights, which means you won’t have the same issue of highlight “ghosts” appearing where enemies no longer are. Stay on the move while your Ultimage is active; don’t waste time aiming down sights or standing still. Be decisive, go for the flank attack, close the gap, and finish them off while you’re still moving quickly. Finally, let’s finish up with some more general tips and tricks on winning Apex Legends matches as Bloodhound. Bloodhound can be played defensively, but shines when played aggressively. Newer players may find comfort in deviating from the path that enemies took less than 60 seconds ago, but Bloodhound’s abilities allow you to utilise an aggressive playstyle extremely well. Work on closing gaps and flank attacks. Communicate your findings with your team. Your Passive ability gives you insights that no one else on your team has, so it’s your responsibility to communicate your findings by pinging the clues you find. For more information on everything you can ping, check out our Apex Legends Ping/Communication guide. Force yourself to be bold and decisive with your actions. Apex Legends is generally dominated by close-quarters combat. Sure, you can hit that shot with a Longbow from 300 metres away, but all they need to do is hide and heal, which is very easy to do in Apex Legends. Bloodhound more than nearly anyone else is a great Legend for teaching you to be decisive with your actions, and not to dance around the fringes of battle, never committing to anything. Don’t be afraid to use your abilities in the heat of battle. While there are obvious times when using your Tactical ability is not the best idea (like when you’re trying to be sneaky), using your Tactical or Ultimate only takes a second or so, which means you only need a second – a literal second – out of harm’s way in order to utilise them. Pair Bloodhound with Bangalore for lots of fun times. A match made in heaven, this combo gives you the fantastic one-two-punch of blasting your enemies with Smoke, then using Bloodhound’s Ultimate to quickly pick them all off while they’re still confused and blinded. That’s everything we’ve got for now on the Technological Tracker that is Bloodhound, but keep checking back every so often to see what new strategies and findings we and the rest of the Apex Legends communities discover as time goes on. Have You Played… Atom Zombie Smasher? 'Atom' is not an adjective though, is it?